Paleo Friendly Cookie Dough Cupcakes! 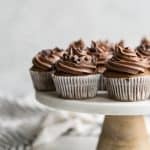 These grain free cupcakes are made with Simple Mills Vanilla Cupcake & Cake Mix to make life easier. Stuffed with a homemade paleo cookie dough bite for a fun surprise. Preheat oven to 350ºF and line cupcake pan with 12 paper liners; set aside. Mix together eggs, oil, water and vanilla in large bowl. Add in 1 box Simple Mills Vanilla Cake & Cupcake Mix and whisk until smooth. Evenly distribute cupcake batter into 12 liners, filling 2/3 way full. Place 1 cookie dough truffle into center of batter. Bake cupcakes for 15-20 minutes. Allow cupcakes to cool completely before frosting. In a large bowl using electric mixer, beat shortening, honey and vanilla on medium-high speed until smooth. Add arrowroot powder and cocoa powder on low speed until combined. Then add melted chocolate, coconut oil and salt mixing on medium speed to combine. Taste test here and decide if you want the frosting a little more sweet. I used 1/3 cup powdered sugar but feel free to add a little more or less. Continue whipping frosting until light and fluffy. Transfer to pastry bag and place in fridge for 10 minutes – this will help set the frosting and make it sturdier for piping. Watch this video for how to fill pastry bag – I also place the bag inside a large cup. Use Wilton tip 1M for swirled style frosting working in circular motion. You can store the cupcakes at room temperature in covered container or place in fridge. Prep the Paleo Cookie Dough Truffles ahead of time and place in fridge. *Simple Mills box says 1/3 cup water but I only used 1/4 cup with the same results. Paleo frosting adapted from The Real Food RN. Or use Simple Mills Chocolate Frosting.